The Underground Gourmet gave West Village newcomer Emmett’s three stars for its “satisfyingly doughy deep-dish” Chicago-style pizza and “disarmingly friendly service.” Meanwhile, Pete Wells visited Gotham West Market and enjoyed plenty of ramen, Spanish tapas, and sandwiches. Alan Richman feasted on rabbit at Mission Cantina, while Ryan Sutton ate (and loved) goat brain at Contra. Read it all, straight ahead. 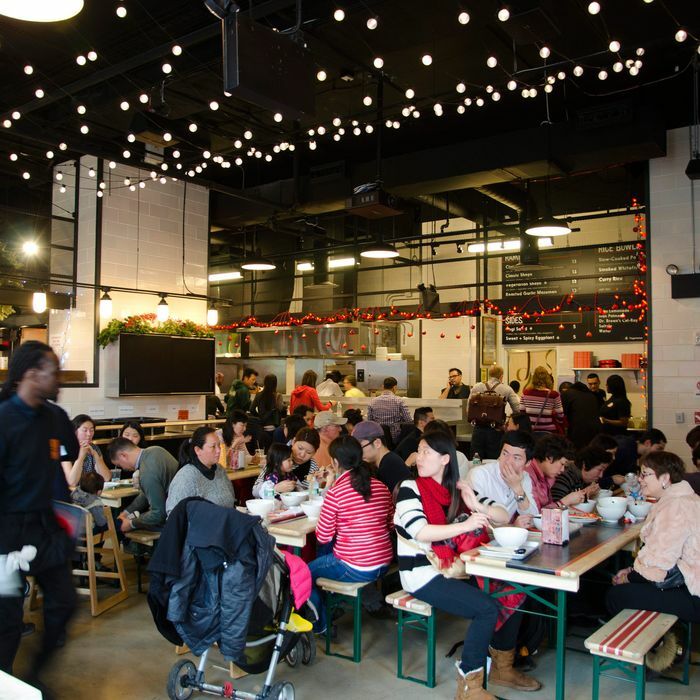 Pete Wells explored the recently opened Gotham West Market in Hell’s Kitchen and gave the “upgraded” food court two stars. Like many others, he was impressed by the noodles at Ivan Ramen Slurp Shop, namely the “supercharged” shio ramen, roasted-garlic mazemen, and the smoked-whitefish rice bowl (“tastes like a Japanese translation of a morning at Russ & Daughters.”) Other must-eats: smoked-eel croquettes at Seamus Mullen’s El Colmado, the scrambled eggs with ricotta on focaccia at Little Chef, spicy lamb sausages at the Cannibal, and the “high-end” heroes from Court Street Grocers Sandwich Shop. His biggest complaint? The Blue Bottle kiosk closes too early, which means the “crisp” almond biscotti and “excellent” shortbreads are only available until 6 p.m.
Alan Richman reviewed Danny Bowien’s Mission Cantina and gave it two stars. He was most impressed by the “exceptional” corn tortillas, which are “soft as a serape.” The frequently changing taco menu has some must-orders: the al pastor, and a skate-wing taco with “perfectly” fried fish. The real stars of the menu are the rotating large plates: “sweet, crunchy, and fiery” fried chicken, and the whole rabbit with coffee-hibiscus mole that reflects the “genius” in Bowien’s cooking. Even side dishes like fresh queso oaxaco (“tastes exactly like mozzarella”) and beer-braised collard greens with creamed masa are successful. His only real gripe? The “creme and salsa overload” and “excess sauces that mute the other ingredients” on nearly every taco. Amelia Lester of The New Yorker enjoyed Amanda Frietag’s revamp of the iconic Empire Diner. The menu is loaded with “unexpected riffs on Greek-diner classics,” most of which are successful. A patty melt made with toasted rye and Swiss cheese is “refined but not annoyingly so,” although it is surprisingly served with taro chips (“what you get from the bodega when you don’t know what you want.”) The lox and burrata is “creamy,” the buffalo-skate-wing appetizer is “weirdly compelling,” and the sweet-chili-relish-topped Brussels sprouts “feel decadent.” For dessert, Frietag serves the “Platonic ideal” of a banana split, made with wet walnuts. Daniel S. Meyer headed to Harlem to check out The Cecil headed up by chef Alexander Smalls. Although the “menu frightens at first glance with its cross-cultural abandon,” there is a “method to the madness” reflected in must-orders like “delicately spiced” jerk bass, feijoada with “rib-sticking depth,” oxtail dumplings in curry sauce that are like “agnolotti vacationing in India,” and “smoky” prawns doused in “piquant” piri-piri sauce. Just be sure to avoid the “disappointing” Nigerian beef suya and the “mushy and wet” fried rice. Three out of five stars. Steve Cuozzo made his way to chef Michael White’s Ristorante Morini on the Upper East Side, where he only had one “wobbly” dish “among the 20-plus” he tried. Some hits: “lemon-lilted” sardine crudo, “deceptively simple” shellfish spaghetti, a “breakout dish” of marsala-braised snails with bone marrow and an almond-milk sformato, and grilled swordfish that “evoked an idealized Sicily.” The dessert menu is rife with “eloquent riffs on old favorites,” like a marscapone cheese torte that “blew away the endless-winter blahs.” As long as you avoid the “rubbery” tuna crudo, your meal will be delicious. Three stars. Ryan Sutton filed a review on two of New York’s most affordable tasting menus, which he recommends over any Restaurant Week option. He enjoyed scrambled-egg-like goat brains, scallops with house-made XO sauce, and poultry with”obscenely crispy” skin and a “swath” of blood pudding on Contra’s $55 tasting menu. Aska’s $39 three-course tasting menu at the bar is also a total steal, with satisfying dishes like toasted-leek soup topped with a soft-cooked egg, glazed oxtail (“braised into submission”) with dry-aged beef fat that “boasts as much flavor as a $50 cut of ribeye,” and a Swedish pancake with milk sorbet for dessert. Two and half stars each.